The political discussion regarding decriminalizing marijuana use is centuries old, yet remains a hot-button issue even today. Where did it all start? Are we heading for a full legalization of marijuana throughout the country? Let's explore some of these questions, as well as a quick look at the increase of its use in the U.S.
- The number of marijuana users (occasional and daily) in the U.S. This accounts for 7.3% of the population. - Marijuana isn't always used for recreation. Its euphoric "high" is often utilized as a natural painkiller for various diseases. But only select states hold the right to disperse it to patients. There are currently 21 states that allow the use of medicinal marijuana, including D.C.
- Where did it all start? Here is a brief timeline of marijuana production and use in the U.S.
- After the Civil War, marijuana is sold in many over-the-counter medicinal products, and hemp is still a common element in clothes manufacturing. - The Pure Food and Drug Act is passed, requiring any product with cannabis in it be labeled appropriately. - After the Mexican Revolution, Mexican immigrants migrate to the United States. Recreational use of marijuana spikes, and the drug becomes associated with the immigrant population. - The Federal Bureau of Narcotics is established, and the federal criminalization of marijuana looms. - The list of states outlawing marijuana rises to 29 as fear and resentment of Mexican immigrants increases during the Great Depression. - "Reefer Madness," the propaganda film intent on scaring middle class white citizens into fearing marijuana use, is released. - Federal mandatory minimum sentences for marijuana possession and use are established. - Recreational use of marijuana increases and creeps into upper-class America. But its effects are scientifically studied and shown not to induce violence. - Many mandatory minimum sentences for marijuana are repealed, and for the first time marijuana is differentiated from other more harmful drugs. - President Ronald Reagan promises to get tough on marijuana use and introduces new federal minimum mandatory sentences. - California's Proposition 215 allows marijuana to be used as a painkiller for various diseases, include AIDS and cancer. - More than a dozen states vote to decriminalize marijuana for medical uses. But because of federal laws, marijuana use and possession still remain chargeable offenses. - Washington and Colorado become the first two states to legalize recreational use of marijuana for some adults. The Doobie Debate: Dangerous Gateway or Harmless Hobby? To some, it's a less-dangerous version of alcohol. To others, it's a hazardous trend that provides a gateway into harder drugs. Let's take a closer look at this debate and where it leaves the U.S. today. There is a clear difference between both the number of people who smoke marijuana today compared to the 20th century and the number of people who are willing to admit it. 1964 - 4 in 100 people had smoked marijuana in the past year. 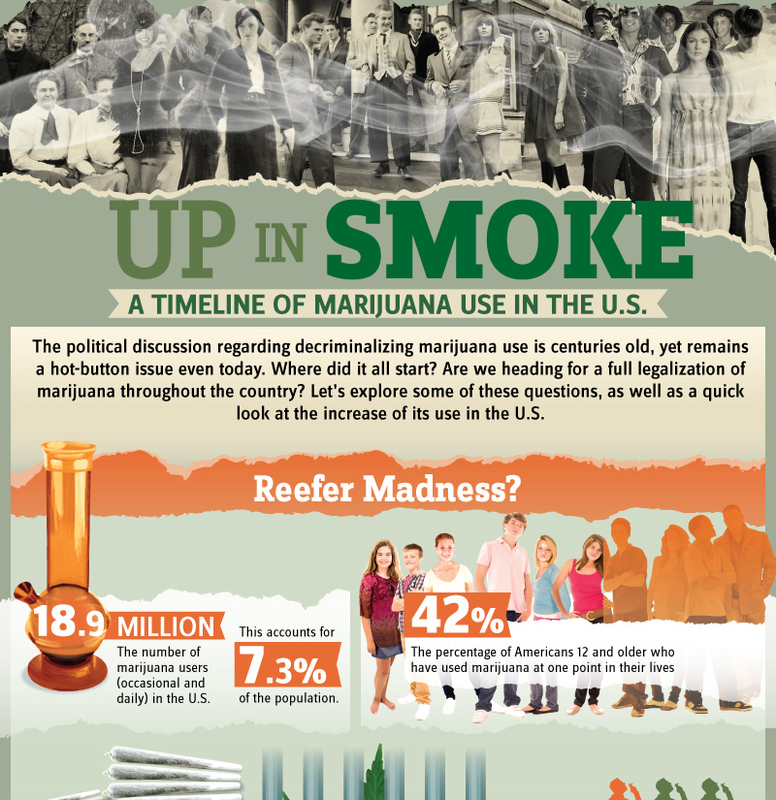 2013 - Gallup polls show that 1 in 4 people have smoked marijuana in the past year. What are the two sides actually saying? Marijuana is no more harmful to the body than alcohol or cigarettes. Crime rates relating to marijuana and drug cartels would reduce. The FDA could regulate the safety of marijuana. Its legalization would free "criminals" who have suffered harsh mandatory minimum sentences in U.S. prisons. Marijuana is a gateway drug to harder, more dangerous drugs. Incidents of intoxicated driving would increase. Those who have been arrested for marijuana-related charges will be back on the streets and committing more crimes. The legalization of marijuana will eventually lead to the legalization of all drugs.